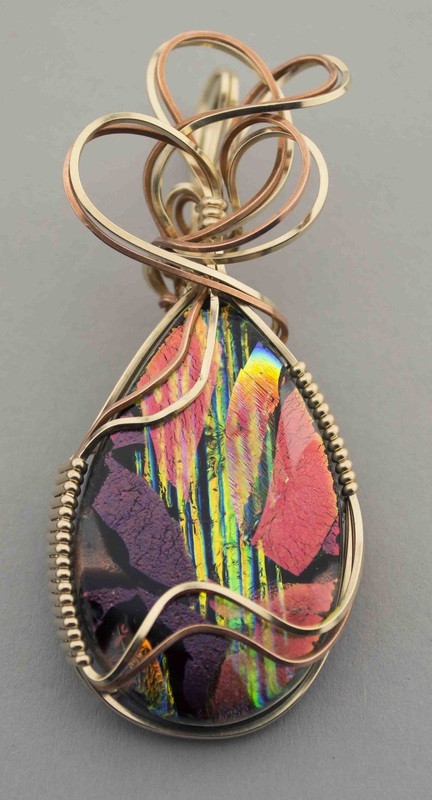 Mike Hertz is one of only 15 people in the U.S. making faceted/beveled and sculpted dichroic glass jewelry. These pieces are very rare. He learned to make them from Kent Lauer, a Master Glass Beveler. Glass faceting and sculpting is an exacting, time-consuming process.The results are fabulous, but it takes time. Jewelry is created using 2 to 5 layers of glass. 2 or 3 of the layers will be dichroic glass and at least 2 will be Starfire glass (see tab on Types of Glass Used). The pieces are cubes or rectangles at that point, then the hand-faceting or sculpting begins. Mike hand-facets or sculpts on a lapidary grinder to achieve all the different shapes he makes. There are several different grinding pads used and the final step is an optical grade cerium oxide powder on a porous felt pad. This grinding process for a faceted piece can take up to 20 hours for one piece. The pieces like the one shown take approx. 8 hours to make. See The Glass Studio page for pictures of Mike at work. Fusing glass is the process of using a kiln to join together pieces of art glass with high temperatures from 1100°F to 1700°F. While the glass is in the kiln it goes through a series of rapid heating cycles, holding the temperature at a specific point, then cooling. There are several of these cycles and the process takes 10-12 hours. This is called “kiln-forming”. Making a piece of fused glass and wire wrapping it takes about 18 hours. The glass is then “cold-worked” with hand tools or the use of equipment such as a saw and grinder to give the art piece a finished look. Gwen has taken several classes from Tanya Viet of AAE Glass in Cape Coral, FL, and plans on taking even more. See the The Glass Studio page for more information about how this is done. Glass is tack fused when glass pieces are put in the kiln at between 1350°F and 1370°F. The glass is tacked together will little deformation beyond softening the edges. Acid etching is a glass process in which a stencil is applied to dichroic glass to mask off the area that will not get etched (in this case the butterfly). A special type of acid product is applied and after the processing is done, it is rinsed off. 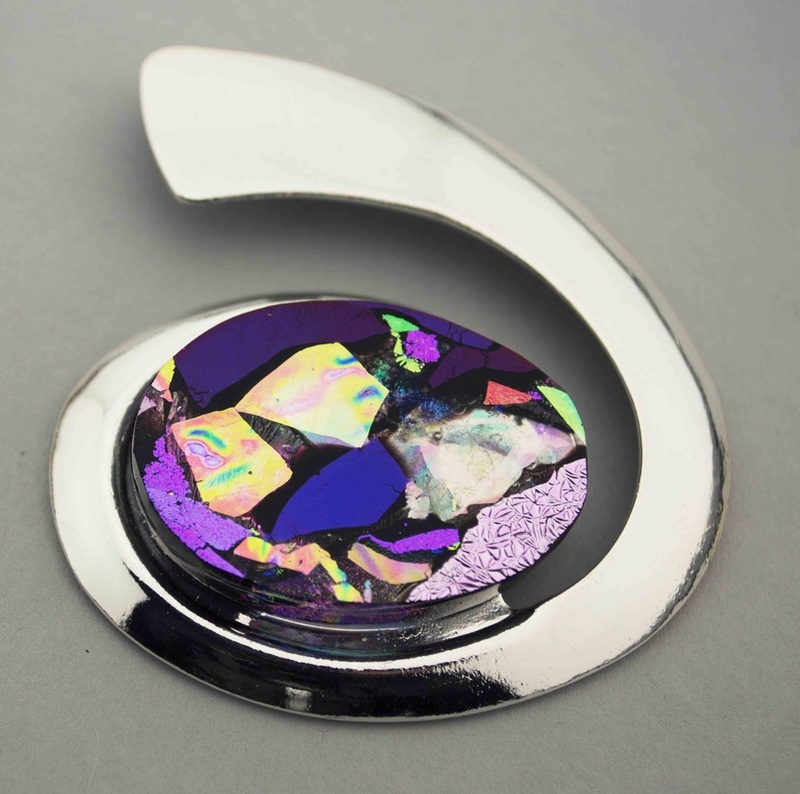 What is left is the shape with the beautiful dichroic glass colors. Another acid etching process involves painting on the acid product over the dichroic glass and creating unique designs with it. Engraving is done on a fused piece of dichroic glass. A dremel is used to hand-engrave a picture, design or Zentangle shapes and finish the edges. Several sizes of dremel bits are used for each design. After it is engraved it is put back in the kiln to be "fire polished". Special high-quality screen printed enamel artwork, that is made to be fired in a kiln, is applied to fused and finished glass. The piece is then kiln-fired. This artwork will never chip, crack or peel. Paints specially made for glass and kiln-firing are used to paint on the glass adding some very interesting looks. "Dimensional fusing" is my term for putting together lots of different kinds of glass to make a piece. We use dichroic, transparent, black backed and clear backed glass. The piece is fused in the kiln, then shaped by hand on a grinder or saw, then put in the kiln again for the final "fire polish". (See "Type of Glass" tab for information on types of glass we use. Commercially-made molds are sometime used to form the glass into specific shapes. These molds are ususally made from ceramic products. After the glass is fused it still needs to be cold-worked by hand to make it look gorgeous. Combing glass is a technique involving working with the glass inside a hot kiln! Strips of glass are laid next to each other, then put in the kiln. The glass is fired up to 1650°F . Special safety gear must be worn to protect the artist from the heat of the kiln. Stainless steel rods are used to "comb" the glass and create interesting patterns in the glass. When it's cool, we usually cut the glass into jewelry-size pieces. Many of the most gorgeous pieces of glass that Classy Creations makes are finished with wire sculpture. Precious metal such as: 14kt gold filled, Sterling Silver, Argentium Silver and silver-filled wire are used. Often Swarovski Elements are added as embellishments. These pieces are heirloom quality and should be taken care of like any other piece of fine jewelry. Larger pieces of glass used to create plates, platters, bowls and other things are draped over a mold or slumped into a mold to create the desired shape. Laura Peirce at Fused Glass Frenzy offers excellent classes in this. Techniques called Pattern Bars and Flow Bars are used to create unique and unusual glass patterns by kiln-forming the glass into a bar then slicing the bar to reveal the beautiful colors and designs inside. We studied under Gil Reynolds and Susan McGarry to learn this technique. Click here to visit the page that is "About Classy Creations".